Clasp: Sterling Silver 8mm Bolt Ring. Hence the reasonable prices, I don't wish to make a huge profit. All of the components are genuine and of good quality. A gorgeous organic looking necklace. Necklace consists of 12 bars forming a chain each one approx 3 cm long. Middle section consists of a scroll design incorporation a white translucent gemstone. Ending 22 Apr at 6:00PM BST2d 8hMetal: Sterling SilverStyle: ChokerLength: 16 - 17.99"
Genuine 925 sterling silver & turquoise bead choker ethnic Bohemian Indian 16.5"
Genuine 925 sterling silver & turquoise choker. This necklace consists of what I believe to be real turquoise and silverplated beads with a 925 sterling silver hallmarked clasp. It weighs roughly 12g. 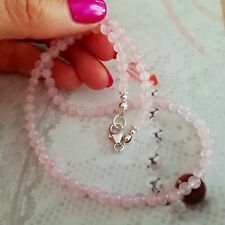 Handmade Sterling Silver 4mm pink Rose Quartz gemstone bead necklace finished with a Sterling Silver Lobster clasp, Sterling Silver beads and Sterling Silver daisy spacers. handmade designer gemstone jewellery. Nautical style dyed red coral chip bead necklace with 925 sterling silver clasp and chain. It weighs approx 36g. The necklace is roughly 1cm wide. Handmade Sterling Silver 4mm blue Turquoise Howlite gemstone bead necklace with 6 5mm Sterling Silver centre beads. handmade designer gemstone jewellery by Nancy Laverge. 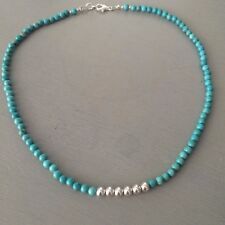 d Designer Sterling Silver dainty Turquoise necklace. Good Weight 15g. Hallmarks: Full assay & Makers marks - JL, London & 925 for Sterling Silver. NECKLACE \ CHOKER. GORGEOUS HIGH QUALITY STERLING SILVER. Handmade Designer Sterling Silver genuine black Onyx gemstone necklace / choker. Onyx is a variety of Chalcedony. Onyx is a 7th Anniversary gemstone. Pretty faceted 4mm Black Onyx gemstone bead necklace with a 5mm Sterling Silver centre bead finished with Sterling Silver lobster clasp. ♥ Happiness ♥ Good fortune ♥ Nurturing ♥ Mothering ♥ Unselfishness ♥ Humanitarian ♥ Love ♥ Hope ♥ Spiritual insight ♥ Easy childbirth ♥ Safe travel ♥ New beginnings ♥ Abundance ♥ Ancient wisdom. Moonstone is composed of Orthoclase and Albite, two species from the Feldspar group. A beautiful 925 stamped sterling silver multi gemstone pendant choker collar necklace weighing a very respectable 23 grams! It is stamped 925 on the back. The necklace is in lovely pre-owned condition and is totally ready to wear! STERLING SILVER FULL DIAMONIQUE CZ STONES PROM BRIDAL NECKLACE 16-18"
Marvellous quality solid 925 sterling silver diamonique style sparkling cubic zirconias full stones front prom/bridal style tennis necklace. This is very well made with great quality of silver and to a lovely standard, this is a dress style piece but it's great quality so could be worn daily. Pretty necklace set with green Marquise cut stones. It is marked 925 on the spring ring clasp. Fabulous chunky marcasite necklace and removable large marcasite heart pendant. The pendant can be worn on other chains and pearl necklaces for a daytime look or on the matching chain for a glitzy look. 925 sterling silver. 16" in length. Heart 2 3/4cms in length by 3cm across. Heart is puffy shape not flat on front. Very heavy set. Fab for valentines. Bought from the US. Ending 24 Apr at 1:50PM BST4d 4hMetal: Sterling SilverStyle: ChokerLength: 16 - 17.99"
New listingSterling silver tube bead & black fresh water pearl bead choker/necklace 17.5"
Type: Choker / Necklace. This necklace is made of Sterling silver tube beads interspaced with black fresh water pearl beads. Beautiful black pearl and silver that goes very well and is very pretty when worn. The width is of the choker is 3 mm. The hallmark consists of "TS 925", together with a rampant lion and a castle. This is a fantastic piece of jewellery. The choker and the pendant are very well proportioned, and these versatile individual components could be worn with other chains/chokers/pendants. A beautiful 925 stamped sterling silver Rennie Mackintosh Celtic style choker collar necklace. The necklace is in pristine pre-owned condition, is ready to wear, and would make a fabulous gift! This delightful 925 stamped sterling silver choker collar necklace comprises a Sajen style sleeping goddess pendant. The trigger clasp is strong, tight and secure, and is also stamped 925. Really gorgeous, Really unusual and in Fantastic pre-owned condition (looking unworn!). The pendant by itself weighs a very generous 17 grams! The elegant V-shaped choker is stamped "Sterling 925" and weighs 15 grams. Coral is of organic origin. Coral can be used to reconnect with nature and its variety of wonders. Coral also attracts love and prosperity, particularly red coral, which is a stone of passion. Unique handmade tiny 4mm tiny real red Coral gemstone bead necklace with a 5mm Sterling Silver center bead finished with a Sterling Silver lobster lobster clasp. It is a variety of chalcedony. The most favorable pieces are a deep red to red-orange hue. Carnelian has a long and storied past, and was once considered strictly the property of the noble class. People holding a high social status were often buried with this gem stone. Turquoise & Coral. Sterling Silver. BERBER BABOOSH. January Birthstone Jewellery : Rose Quartz. Dainty Sterling Silver Rose Quartz pendant necklace. Rose quartz is known as the love stone. Rose quartz is the stone of universal love. It is also the stone of love in marriage. Amazing quality solid 925 sterling silver round rigid sturdy choker necklace with a large whale tail style slider pendant and a blue Sapphire in the center and a satin finish on the front. The Sapphire is 5x3mm in size. With a Rhodolite Garnet gemstone (tested) cabochon cut, deep burgundy. Beautiful solid silver necklace/choker. A stunning drop necklace which can be worn at 16" or 18" length. The oxidisation sections of the necklace contrast beautifully with the amber gemstones and the more highly polished silver beads. The necklace is stamped 925 on the safe and secure trigger clasp. Gorgeous quality solid 925 Sterling silver diamonique or cubic style sparkling front design stones choker/necklace with clear fine looking bezel set stones at the front and simulated stones design in solid silver in the neck area. This is a very well made piece, made with great quality of silver and finished with a Rhodium plate for shine, this is a lovely quality item and could be worn daily. Not fully hallmarked but stamped 925 on clasp and on the back of the teardrop, it also tests as sterling but has a Rhodium plated finish. Coral is of organic origin. Coral can be used to reconnect with nature and its variety of wonders. Coral also attracts love and prosperity, particularly red coral, which is a stone of passion. Creativity and optimism are also qualities that coral brings out. Pretty white agate gemstone Choker. CHOKER NECKLACE. These white agate beads are 6mm and interspaced with galvanised silver seed beads. 7 or 28 strand wire used in pearl Necklaces. Hand Strung with Sterling Silver beads and bolt ring Clasp. Pink Cubic Zirconia encrusted handbag charm and T Bar. Oustanding really uncommon quality 925 solid sterling silver wide fronted greek key design choker/collar style necklace with a highly polished Mother of Pearl oval cabochon set in to the silver. This is a really well made piece, made to a high standard, it is chic looking and so would suit daily wear. Green Aventurine and Black Obsidian Sterling Silver Necklace. Green Aventurine round shape 8mm. Black Obsidian round shape 6mm. Choker Necklace. Gemstone Details. Necklace has extender chain. Necklace weight 64 grams. Collection station availableMetal: Sterling SilverStyle: ChokerLength: 16 - 17.99"
This stunningly elegant 925 stamped sterling silver garnet and cultured pearl necklace is evocative of the Edwardian/Victorian eras. The necklace is stamped 925 on the back, and weighs a respectable 13 grams. Great quality native made 925 sterling silver Leopard Jasper stone beads and sterling beads necklace. A beautifully made piece and not common by design. This is great quality, sturdy and and would suit would daily wear. Silver & Cubic Zirconia Collarette. Hinged Lobster Claw Catch. 8 pretty flowers fall gently in the centre with 5 single stone set flower each side. Complete with presentation box. Unwanted Gift. 926 Sterling Silver Marcasite Choker Necklace With Flower Sections Lgth 16.1/2"
As well as bearing a full range of hallmarks, the choker is also stamped 925. There are five different shapes of faceted garnets, and these are plentiful. There is also a small round faceted garnet fronting the bail. With clusters of 5 dark green, faceted jasper and a central cluster of 7 stones this really is a good looking necklace, sterling silver bars and balls alternate between the stones. Beautiful and unusual silver necklace with green jasper. The Chunky focal Pendant has the most incredible detail with a Black Onyx gemstone set into the middle. The focal pendant snuggly sits upon this Black Onyx & Bali Silver Beaded Necklace giving it a unique style. Both the necklace and earrings together weigh an equally sensational 70 grams! The 925 stamped sterling silver necklace is fully hallmarked and weighs an impressive 54 grams on its own. The full range of hallmarks include the maker's/sponsor's initials, "LS". 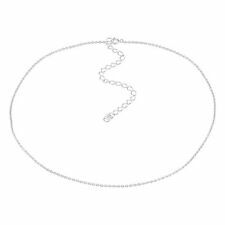 Sterling Silver Choker made with Genuine Swarovski® Crystal Pearls. Width : 1cm. Modern 925 Sterling Silver Lapis & Clear CZ Gem Set Collarette Necklace. Weight - 56g. The bracelet is 925 Sterling Silver. We have examined and tested it to be certain. We think this is fair. A particularly desirable, fully hallmarked 925 sterling silver star spangled (or sun spangled) free-form amber nugget pendant designer choker collar necklace, weighing a respectable 29 grams. Both the choker and the pendant are stamped with the full range of 925 sterling silver hallmarks.